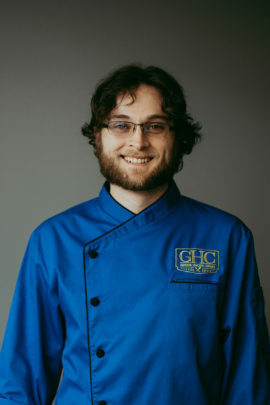 Meet Blue Coat Chef Caleb. Caleb is multi-talented and has 11+ years of experience working in the restaurant industry as well as a background in Nutrition & Food Science. Caleb’s passion for cooking comes from watching and learning from his favorite chefs Alton Brown and Anthony Bourdain. He is always up for a challenge and likes to create new dishes with items that he is unfamiliar with so that he can continue to learn and grow as a chef. Caleb is an avid local farmer supporter and loves spoiling his fraternity with the freshest ingredients. Caleb says that the most rewarding part of his job is the constant appreciation he hears from his chapter house and how much they love his food.